When we can slow down and really enjoy our food, our life and our health, we can take on a much deeper quality. I love to sit and eat quietly and enjoy each bite, aware of the presence of my community, aware of all the hard and loving work that has gone into my food. 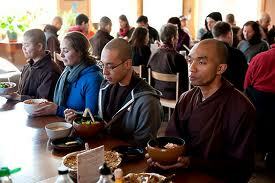 When I eat in this way, not only am I physically nourished, I am also spiritually nourished. The way I eat influences everything else that I do during the day. If I can look deeply into my food and take this time as a meditation - just as important as my sitting or walking meditation time - I receive the many gifts of the cosmos that I would not otherwise profit from if my mind were elsewhere. Because if I eat and am consumed by my worries and projects, I am eating a lot of stress and fear and this is harmful to my body and mind.